Posted in: Art, Music, Photography. Tagged: 1830–1903, Afternoon (1898), Camille Pissarro, French, Moody Blues, Rue Saint-Honoré, Sun Effect, Tuesday Afternoon. This vertically oriented canvas depicts an urban street scene, specifically a large square at the intersection of two avenues, painted from an elevated viewpoint. The long avenue on the left side of the composition recedes sharply into the distance, framed on either side by tall, multistoried buildings with street level storefronts. In the right foreground, a fountain is positioned in the middle of the square on a paved circular base planted with tall trees; a tall streetlamp on a smaller circular base is positioned just in front of the fountain. 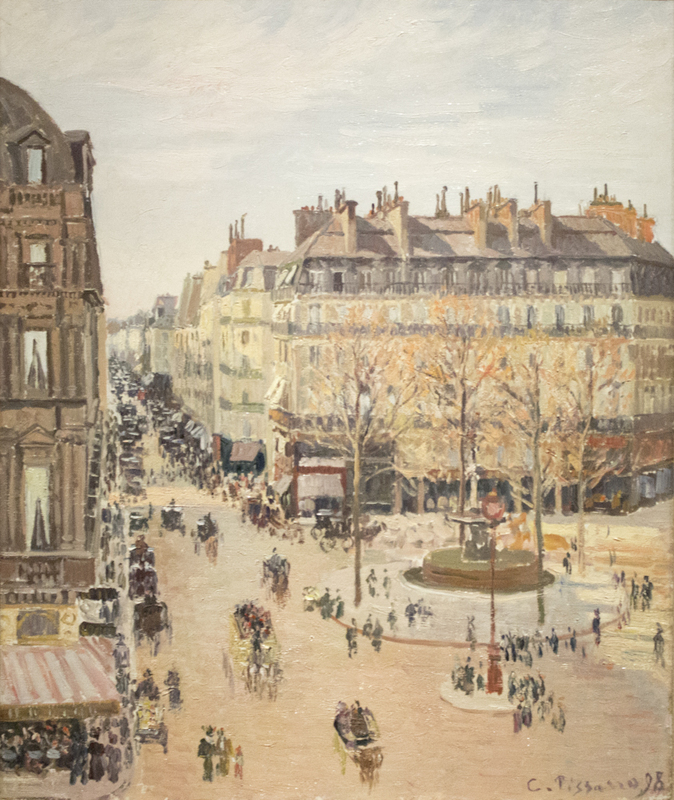 In the right middle ground, a band of Haussmann-style Parisian buildings stretches horizontally across the composition. The trajectory of the second avenue is suggested by the angle of the building at the far right. Numerous clusters of sparsely painted figures and horse-drawn carriages populate the streets and paved islands. The palette is a harmony of muted pastel tones punctuated by the dark brown and black forms of people, horses, and carriages. The brushwork is a mixture of short and long strokes rapidly applied in a loose, sketch-like manner. This looks so much like the cobbled squares in Europe and also liked the way the artist can create an illusion of crowd by a mere stroke of a brush. You’re right Megha and it is amazing the artist’s talent. I love Camille Pissarro – gorgeous. I agree Pissarro was great.